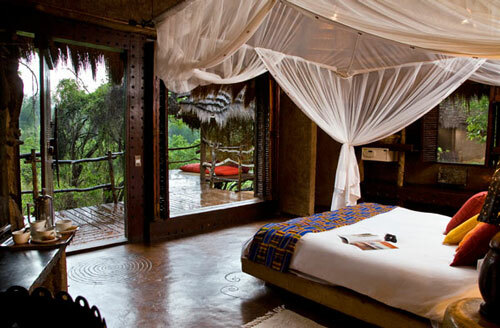 Makalali Private Game Lodge is nestled on 14 000 hectares of conservancy, Makalali Private Game Reserve. Four exclusive camps, each consisting of six spacious suites adjacent to a stilted Sala set amongst Jackalberry trees, are equipped with all the Modern Conveniences. Amenities on offer at each camp include a uniquely designed swimming pool, boma, air-conditioning, and an enclosed dining and lounge area. 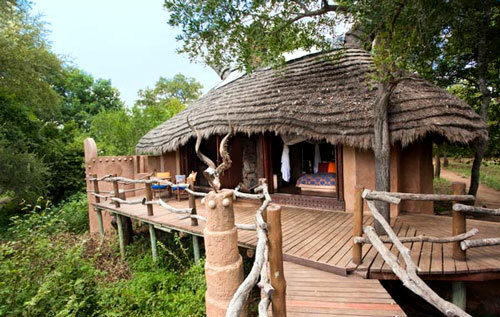 Considered one of the Leading Pioneers In Ecotourism in South Africa, Makalali Private Game Reserve represents a conservation mission to expand South Africa's green frontier by re-establishing the ancient wildlife migration routes that linked the famous Kruger Park in the east to the lush Drakensberg Mountains in the west. In the process lion, cheetah, leopard, elephant, and rhino have all been reintroduced to the wild, making Makalali Home to over one Thousand Wild Animals including four of Africa's "Big Five". Raised timber "sala" which doubles as a lounge or dayroom, or as a viewing platform. Makalali, meaning "Place of Rest" in Shangaan, has four separate 12 bed camps, situated on the banks of the Makhutswi River. Luxury accommodation is offered and each air-conditioned suite has a King Size bed, an en-suite bathroom, an outside shower, a private deck, a fireplace and a raised timber "sala" which doubles as a lounge or dayroom, or as a viewing platform. The rooms are decorated in African Design Styles with sculptured ceramic taps and basins. 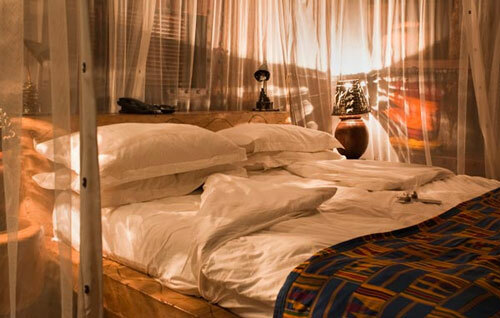 All rooms are fitted with mosquito nets, and guests are supplied with insect repellent, but please note that Makalali is a Malaria Area and malaria tablets are recommended all year round. Families with children are welcome at Makalali. 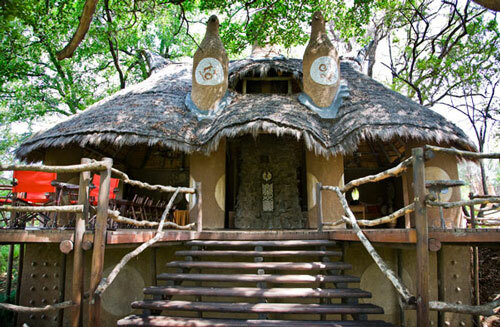 Kiddies' walks and daytime Game Drives can be set up in order for the children to also experience the magic of Makalali. Children are welcomed with a special Makalali colour-in book and games on arrival in Camp. Special meals are also arranged for the little ones, including dishes such as Burger and Pizzas. 220v A.C. current is available 24 hours a day. Voltage converters can be supplied on request. All laundry is washed by hand and dried naturally, except during bad weather, when the tumble drier is used. This service is complimentary. A dry cleaning service is not available. Guests usually enjoy dining together in the communal dining area, however private drinks and meals can be arranged on request. Makalali is the ideal safari destination, with activities including game drives in open land Rovers accompanied by professional game rangers and trackers, photographic excursions, bird-watching safaris, stargazing, day trip to the Kruger national Park and tribal dancing, are all available on a daily basis. Your journey start with a rapid climb onto and through the rugged yet picturesque plateau of the Drakensburg mountains and then descending down into the Lowveld plains. Pleaces of interest along your way, include the Blyde River canyon (gigantic gorge more than 20 km long, cut out of the escarpment) and Bourke's Luck Potholes (deep cylindrical cavities formed by swirling action of flood waters). Pilgrims Rest (exact replica of a 19th Century mining town and Graskop (a forestry village perked on a spur of the escarpment). Rates include a lunch at Pilgrims Rest and all entrance fees. Educational Walks (giving you insight into some of the local superstitions and uses of a wide variety of plants), birding walks (because we are a lot more quiet when we walk, calls can easily be heard and identified, especially in and around the lovely Makutswi river), or for fitness enthusiast, more strenuous walks, are all available daily for no extra charge.